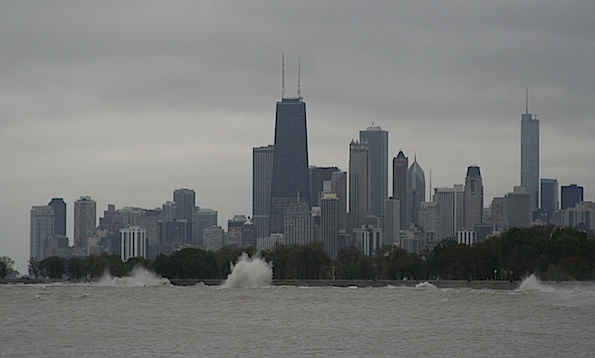 View of Chicago skyline from Montrose Harbor with waves crashing the shore. High winds and high waves overnight from Wednesday to Thursday caused minor power problems. Arlington Heights firefighters responded to a snapped utility pole and power lines down, just south of Lake Arlington in the 1700 block of East Jonquil Terrace. As of 5:30 a.m., only 3,100 customers ComEd customers in Chicagoland were without power. The outage affected up to 8,300 customers about midnight. Many of the higher winds and outages were closer to Lake Michigan. About 2,200 ComEd customers were without power in the City of Chicago. Several transformer fires or arcing wires were reported in several suburbs. 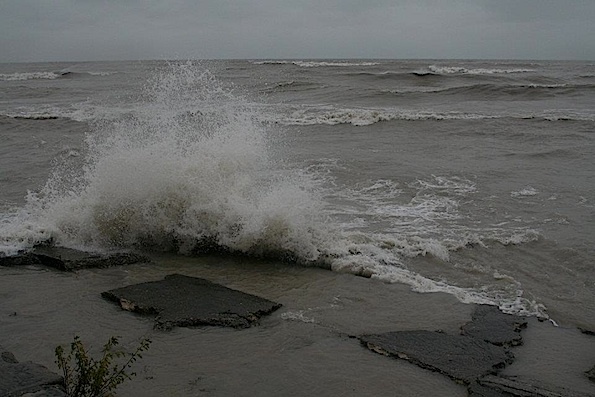 Waves crash the Lake Michigan Thursday morning just south of Foster Avenue Beach. MORNING AND TO LESS THAN 15 FEET BY LATE THIS AFTERNOON. Waves battering the beach north of Montrose Harbor — Montrose Beach and Foster Avenue Beach.